Finding a good burger in Japan can be difficult, but it can be a very tasty experience. 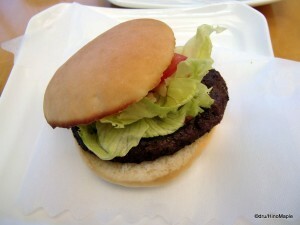 In Japan, fast food burgers congers up images of shrimp burgers or teriyaki burgers. This is a very true assumption, but it is far from the truth of Japanese fast food burgers. There are several chains, but by and far, MOS Burger is the cream of the crop. Other major chains include Freshness Burger, Lotteria, and First Kitchen. They all tend to be inferior compared to MOS, and even McDonald’s can’t live up to the quality of a fresh MOS Burger. Whenever I have friends come to visit, we always go to MOS as I want them to try it. Whether you like it or not will depend on your own personal palate. I don’t necessarily recommend it to everyone, especially if you only want to eat traditional Japanese food. If you are looking for a unique take on American food, this is one of the best ways to do it. MOS Burger stands for Mountain, Ocean, Sun burger. It is a take on the environment, and the CEO promotes an image of “healthy” food from healthy sources. Whenever you order MOS Burger food, you can usually find advertising on their trays talking about how their products are made and where they obtain their basic ingredients. The stores tend to be extremely clean, and the food isn’t made until you order it. In fact, if you check out their corporate website, in Japanese, they give a lot of information on how they obtain their food and the basic preparation techniques. The menu itself is somewhat pricey. It’s not as cheap as McDonald’s, nor do they have as large a portion, but the quality of their ingredients generally makes up for this. Their basic burgers are delicious and include options such as a Teriyaki Burger, Pork Burger, and my personal favourite, the basic MOS Burger. 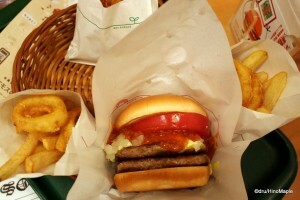 The MOS Burger itself is similar to a basic hamburger with tomato meat sauce on top. You can add cheese or jalapeno peppers on top as well. I almost always add jalapeno peppers. The entire menu can be doubled so that you have two meat patties instead of one. This might be necessary if you have a big appetite since the portions tend to be a little small. The most unique item has to be the rice burgers. There are three options that utilize a rice bun instead of a standard hamburger bun. While I’m not a big fan of these burgers, they are popular and worth a try if you want something unique. They also tend to be the only vegetarian option on the menu. There are also hot dogs, desert, and other standard American fast food fare. One of the better options is to get a set that includes a mixture of thick cut french fries with onion rings. You can order this as a set with a burger which includes a drink. I’d also recommend trying the soup. The soup at MOS Burger is a great alternative to Coke and hopefully healthier. They have three basic soups, corn, clam chowder, and minestrone. Do be aware that some shops don’t have all flavours of soup at the same time, and you can substitute soup for a drink if you order a drink set. While MOS Burger is the best place to get a Japanese version of American fast food, there are plenty of other shops that are available as well. The most expensive, but delicious option, is Freshness Burger. It’s a fairly small franchise that tastes almost as good as MOS Burger. The biggest problem is that they tend to be extremely expensive compared to standard fast food joints, and there are no deals if you buy a set. Their motto is “Organic and Natural” which is pretty true to the name. Their old claim to fame was the fact that you could order mini burgers so that you could try more than one burger at a time. I don’t believe they have this anymore as it would be a little too expensive. For this chain, they have the Freshness Burger which is similar to a MOS Burger. The major difference is that they add a huge slice of tomato into the burger. The pictures on the menu don’t exaggerate the size at all. It is truly a big slice of tomato. Of the other menu items, the Teriyaki Burger is the only one I’d recommend, but it’s fun to try everything. I’m not a big fan of this shop, and there are only a hand full compared to the other chains. If you have money to burn, and want to eat something that is of cafe style quality, I’d recommend visiting this shop. Otherwise, the other shops are cheaper and better than Freshness Burger. Both of these shops are great and offer something that is fairly unique compared to the traditional American fast food chains in America. 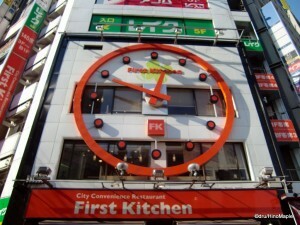 While the burgers are more Japanese than other fast food outlets, they aren’t completely Japanese. Fusion is a good way to put it, but there are other shops that create a fusion style burger as well, but not quite as unique as these. This entry was posted in Food and tagged burger, First Kitchen, Freshness Burger, hamburger, japan, Lotteria, McDonalds, MOS, MOS Burger by Dru. Bookmark the permalink.